This comfortable 2 bedroom house with private pool, sleeps 4. The pool (with safety alarm and dimensions of 5m x 9m) has its own terrace and is surrounded by a large garden area. The pool is only available to the guests staying at the house. The house has everything you need for a comfortable stay with bed linen, towels and pool towels are all included. The village of Duravel with its narrow streets and old stone houses is surrounded by woods, green pastures and centuries of old family vineyards. Free wifi available. Bathroom with walk-in shower and wash hand basin. Separete WC. En-suite shower and wash hand basin to bedroom 1. The living area has sofa and sofa bed, TV (satellite TV with English stations), DVD player and CD/radio player PS 2 (with a selection of games). The house has a well equipped, modern kitchen with oven, hob, dishwasher, fridge/freezer, microwave and Nespresso coffee machine. There is a dining area with table and 6 chairs. Indoor and outdoor dining area. Golf de Roucous, 45 minute drive away. Outside: The 5 x 9m private swimming pool is for guests only. The pool has its own terrace with sun loungers and a safety alarm. There is also a large decked area with swing sofa, garden table and chairs and a barbecue for comfortable outdoor dining. Utility Room: Washing machine, iron and ironing board. Cleaning / Towels / Linen: Towels and linen included. une maison confortable et spacieuse avec une superbe piscine et située non loin des sites touristiques, c'est la location idéale ! We booked this property for our son, daughter in law and three children,aged 7,5 and nearly 4, and it was just perfect. The house has everything one needs for a comfortable stay and the outside area is just wonderful with a spacious decked area for al fresco meals and a lovely pool which was well used by all, in fact it was difficult to get the children away from the property as they were enjoying themselves so much. Duravel is a friendly village with most of the amenities one needs to make a holiday enjoyable. I would strongly recommend the house for a relaxing holiday for a couple or a family of four to five. We had our holiday booked for some time and couldn't wait for it to start. The house is absolutely fabulous and is probably one of the best houses/villas we have ever stayed in. It's perfect for both a couple as we were or a family, it's clean and has everything you could ever need including things like salt, pepper, olive oil, washing powder that sometimes you just don't get in other places. The size of the house is excellent and the outside space is just fantastic; incredible pool with equally amazing views, the option on sun or shade and a really good barbecue. The location is great, really close to all well known villages and towns and the shop and bakery in the village are really good too - all the essentials you could need in them. I would recommend to anyone thinking about booking to book it, Brona has also been excellent with the information she has sent and we didn't feel at all like we needed further information or concerned about our trip. On a personal note, thank you to Brona and Eoin for letting us stay in you lovely French property! I'm gutted our holiday is over and I'm not sitting by that pool sipping on my glass of wine! Lauren, what a lovely review, thank you for your kind words. We are so delighted to hear that you had a great week! Best wishes, Brona & Eoin. Just came back from a lovely week in Duravel. The house is lovely, it's in a great location and has all the comforts of home but in a stunning location. The outside space is fantastic with ample decking to enjoy eating outside, and a great pool which I couldn't get my children out of! The house is in such a picturesque and peaceful location and the village is just a short walk or even shorter drive away. We had a few trips out to Chateau de Bonaguil, Villeneuve and Cahors (in my opinion Cahors is better than Villeneuve) and meals out at local restaurants. We all thoroughly enjoyed our week at Duravel and I would have no hesitation in recommending this house to anyone or indeed returning for another holiday. So pleased that you had a good holiday and many thanks for booking with us this year. Lovely property, spacious, clean, well maintained, good quality furnishings, well equipped kitchen with modern facilities and situated in a very picturesque area of France. We like to explore surrounding areas while on holidays and found this to be a good central location, within an easy drive to Cahors, Sarlat, Puy l’eveque, Villeneuve, Monpazier etc, towns with great markets and well worth a visit. House has a lovely pool and deck for some downtime and eating al fresco. Friendly bar in the middle of the town, 5 minute walk away. There is also a pizzeria. This was our second visit to the property and would not hesitate to recommend. 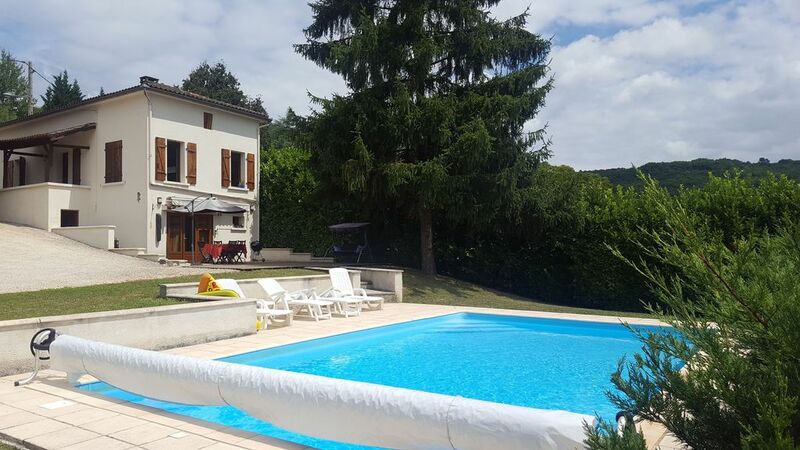 Highly recommend this super house in the stunning location of Duravel. This beautiful house is very well looked after and has everything you need for a great holiday. Stunning views and a fantastic pool and garden (which you won't want to leave!) The stunning French village is only 2 minute walk away. The village has again everything you need, shop, chemist, great bar and restaurant. Don't miss the great Pizza van that arrives to the village each Tuesday. Yummy! Also lots to do nearby like Kayaking, beautiful walks, other villages to explore, some lovely shops and markets. We have had a few fantastic holidays here and we will definitely be booking again! Love it....5 Stars!! There are many nearby facilities for canoeing, cycling and walking. Walibi Theme Park, just outside Agen, is great fun for all the family. By air: Bergerac 45 minutes. Toulouse 2 hours. Rodez 2 hours. Carcassone 2.5 hours. By train: The TGV from Paris stops at Agen, Cahors or Bergerac. Car hire is available at these locations. A 5 minute walk takes you into the centre of Duravel where there is a bakers (closed Mondays), grocery store, restaurant/bar (http://www.dfamilyandco.fr) , tabac, chemist, hairdressers and tourist information.There is a small market in Duravel on Saturday. A more comprehensive shop can be made at the supermarket in Montayral which is about a 10 minute drive away. The well known medieval village of Puy L'eveque, situated on the Lot river, is just 6 km away. Here you will find a good selection of bars, restaurants and other facilities including canoeing. The larger cities of Cahors and Villeneuve are both about 40 minutes away. Changeover Day: Changeovers are on a Saturday. Guests are required to leave by 10am and to arrive after 4pm. (Unless special arrangements have been agreed). Notes on prices: Prices are for the property per week in euros.